Oral Interview with William Wolff. Interviewed by Alisa Lazear for Feeding Community podcast. 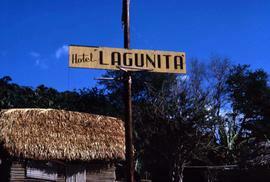 Colour Kodachrome 35mm slide depicts a sign that reads: "Hotel Lagunita" with a small building with a thatched roof. Colour Kodachrome 35mm slide depicts a street with cars and buildings on the left of the image with lights hanging from the power lines and trees which are along the edge of the street. Colour Kodachrome 35mm slide depicts a man walking away from the camera down the centre of a street with cars driving on either side. 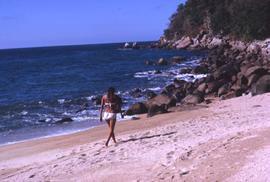 Colour Kodachrome 35mm slide depicts a street with a statue in the background with buildings on the right side of the image, cars on the street and a person walking in the foreground.